Hi dolls I hope you are all having a great day! I just want to update you on a couple of things. Private Sale on Nov 16th - you need a pass. 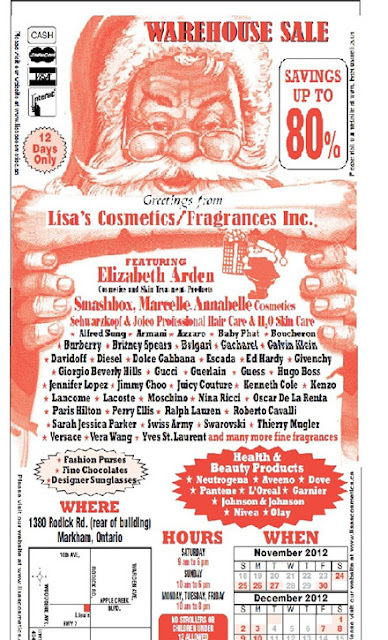 Next, there will be a Lisa's Cosmetics warehouse sale in the end of November and the beginning of December. Both warehouse sales are in GTA, so if you live close to this area, both sales are worth checking out. This year, I won't be going to the Shiseido warehouse sale because I'm going to IMATS Toronto!! I'm so excited! This will be my first time going there and of course I will be taking lots of photos and I will do a haul as soon as I have the time which leads me to the next thing, my birthday is this Sunday. Last year, I had a birthday party with my friends but this year, I will just go out for lunch with my parents and relax. I could really use some family time with my parents :D I will be going to the Lisa's cosmetics sale but I don't know when since this one is pretty long, I'll go when I get the time. hmmm I think that's about it. photos of my life and random things. Hi! I would like to open beauty salon. Does anybody have an experience in this business? There are too many options in different salon equipment. Could anybody give me an advise? What store is more reliable to buy Tattoo ink and Tattoo ink sets. I'm choosing between Advance-Esthetic and Spa&Equipment websites.